This was my very first CNC Plasma cutter. I built it using a smaller 18”x 14” KRMx02 build. The vent system consists of a 1500CFM blower connected directly to the downdraft enclosure. The blower connects so a series of 8” duct work that exits my shop. The outside duct work exits the shop and ends with a metal screen to keep the bugs out. I can also place a metal can under the duct work if needed. 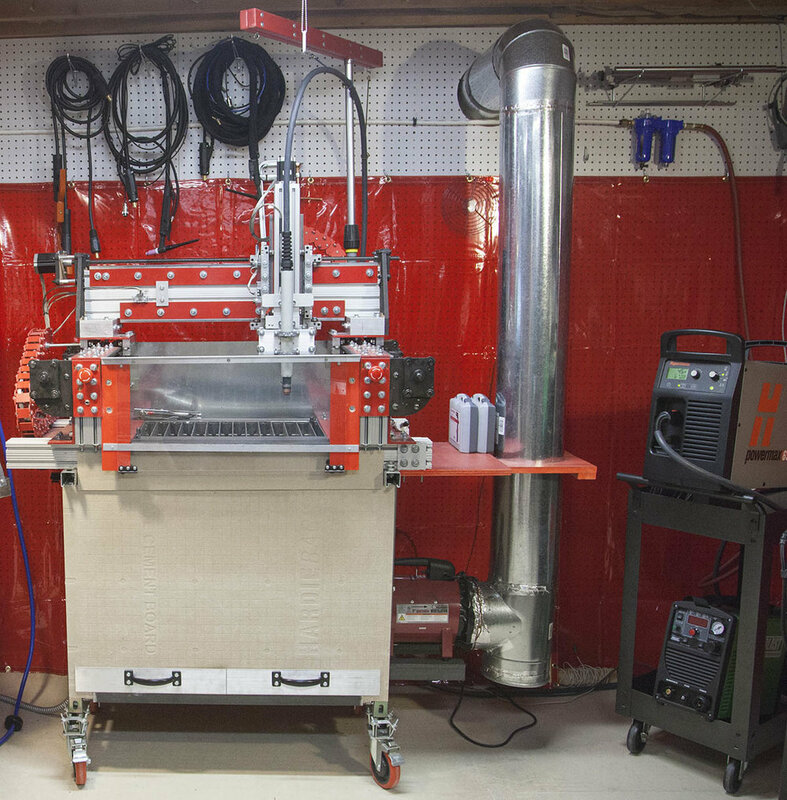 I used this system on the KRMx02 plasma cutter for almost two years. It worked pretty good with a couple issues that I will get into later. This system with a overhead air cleaner kept my shop free of plasma dust. Once I added plasma capability to one of my first CNCCS prototypes. I was able to reuse the same vent system. An 8” duct exited the downdraft enclosure and into the same blower sitting on a lower shelf. The blower output connected to the same vent system. This system worked well, again with a couple exceptions. I used it for over a year, until now. With the blower located at the downdraft, you get the full benefit of blower suction. No mater how many leaks you have in your system, the suction does not change. Those leaks however, come into play as they can blow out some of the plasma dust and fumes, as shown here. With the blower located at point where the vent exits the shop, leaks no longer spew plasma dust and fumes. They do affect the raw suction that is delivered to your downdraft enclosure. That said you can add more blowers or even a larger blower to help improve suction if the need arises. Another advantage to this type system, is that it makes it easier to add more then one source. 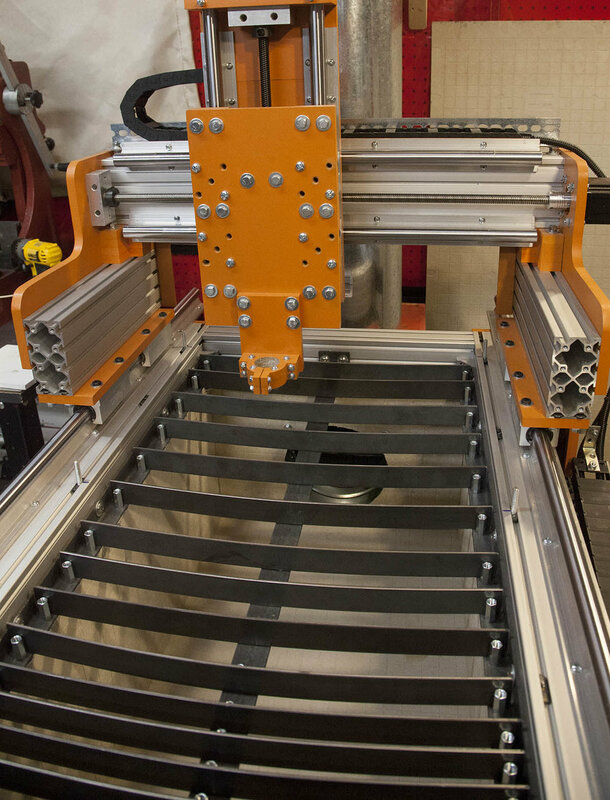 For instance I could have a plasma CNC and a standalone down draft. I need to do is to install a damper at each location to shut off the air flow when not in use. I decided to take this approach with my next plasma vent system. I removed all the duct work leading up to the first corner where it exits my shop. I know I need to add some spacers to pull the blower away from the wall. The blower I am using has some small rubber feet. This blower is available from multiple sources. The one shown here was purchased from Harbor Freight. Here is one that can be purchased from Amazon. The feet need to be removed as shown here. 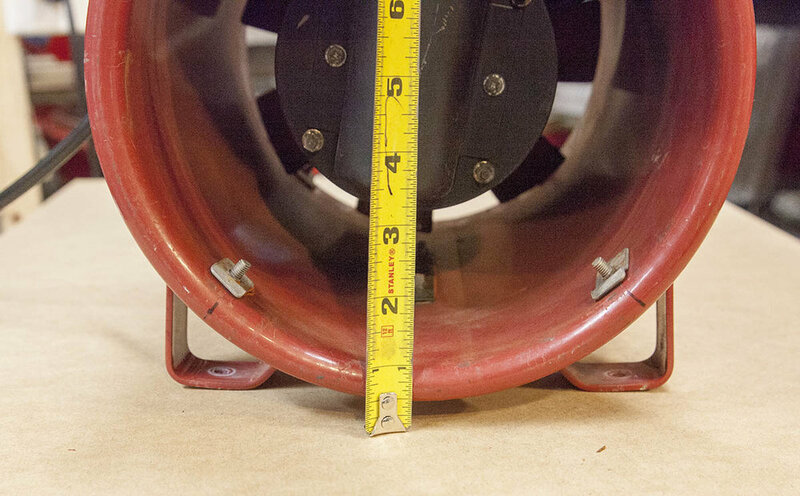 Now take a measurement from the base to the inside edge of the blower. It is about 1”. So 6-1/2” from before minus the 1” from the blower leaves 5-1/2”. That’s how much I need to raise the blower so that it will mate with the duct work. I started by cutting a piece of 3/4” stock 11” x 2” and a piece of 1/2” stock 11” x 2”. I stacked these and mounted them to the bottom rear of the blower with some #10-32 x 2” machine screws and hardware. I duplicated it all on the bottom front of the blower as well. OK this takes us to 1-1/4”. 4-1/4” to go. I took a couple pieces of 2x4 and cut them to a length of about 18” long and attached the blower with mounts to these as shown here. Note that you don’t need to add the angled cuts on the end. Mine already had these cuts as they were scrap. In reality a 2x4 13” long would work just fine. OK the 2x4 is actually 3-1/5” tall so now all we need is 3/4” more. I took two pieces of 3/4” thick stock 2” x 19” and attached them to the bottom of the 2x4” as shown here. I made sure they would span two studs in my wall so I could securely mount them. Lets check the blower height now. Its 6-1/2”. Just what we need. I held the blower in place and marked the location of my studs. This allowed me to drill some pilot holes and attach a couple screws. I placed the blower into position firmly against the duct and screwed it into place. This is much easier if you have a helper. Notice the air flow direction. It must be blowing up and out of the shop. 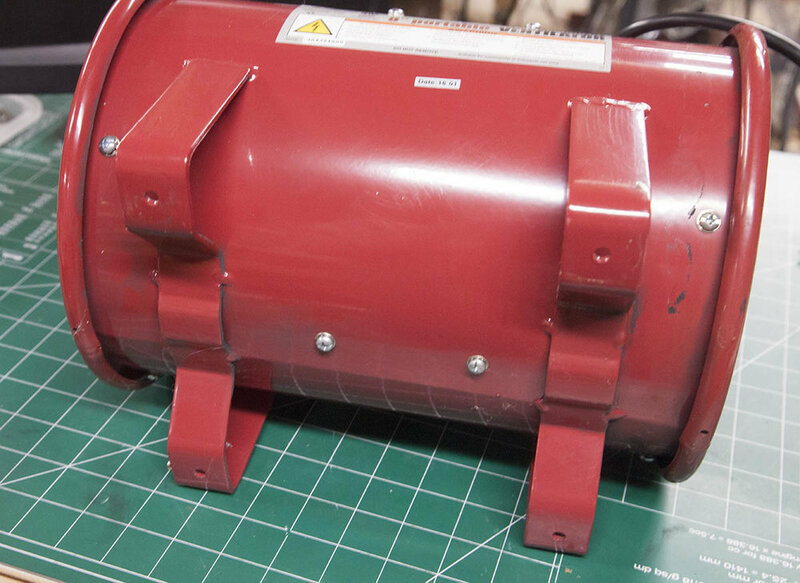 With the blower mounted, I used metal tape to seal the seam between the duct and the blower. I also taped all the seams on the elbow. I added an elbow to the collar mounted on the downdraft enclosure. I then added a piece of duct that would reach the blower. I moved the machine until the duct touches the bottom of the blower and placed a mark as shown here. I extended the mark around the duct and used some snips to cut the duct as shown here. Note that it will be much easier to cut if you open the duct at the seam. It is very easy to snap the seam back into place once it is cut. I move the duct in place and tape the seal. The easiest way to do this is to reattach the duct and elbow to the CNC and roll it into position. Once taped it wont fall. Note the piece of wood mounted to the wall. This will help hold the duct in-place while we roll the CNC into position. Note that the elbow connected to the bottom of the duct is not taped. This allows me to change the position of the CNC when needed. I add a piece of 3/4” stock with a 8” cutout to one side. Then a second one is added to the other side. A piece is then attached to the front to hold everything in-place. 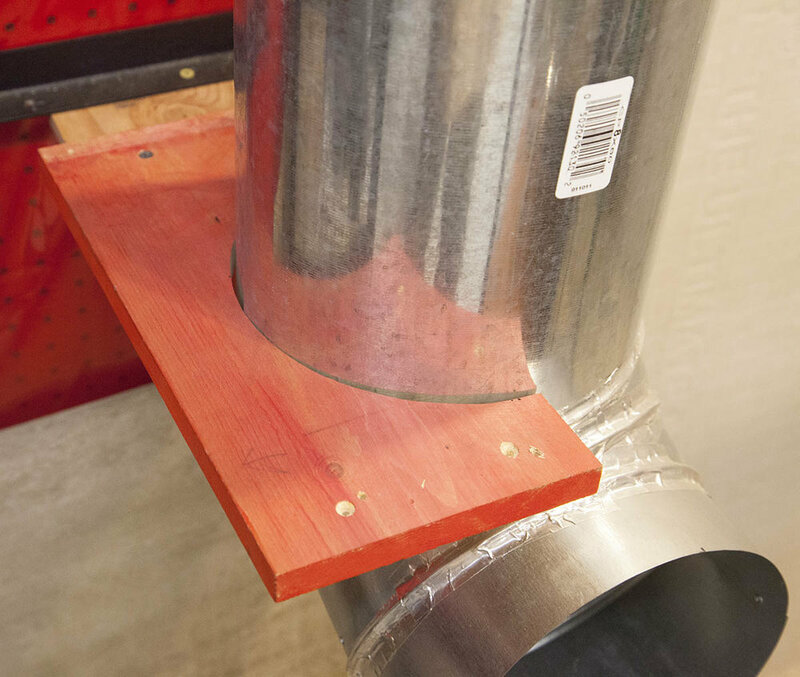 To use the ventilation system, the CNC is rolled into position until the collar enters the elbow. Because I used an existing duct system, it was a little more complicated than it needs to be. I do plan on a second vent in the future. It will use this vent hood I picked up from Amazon. It has spring damper that opens when the airflow starts. I can connect the blower directly inline for even more suction. This will be a much simpler design with no elbows. Every duct system will be a little (or lot) different. It all depends on how you plan on getting the ducts outside. It may involve a window or even a system you roll into place as needed. If you plan on using the plasma cutter a lot, I do recommend a dedicated vent egress.